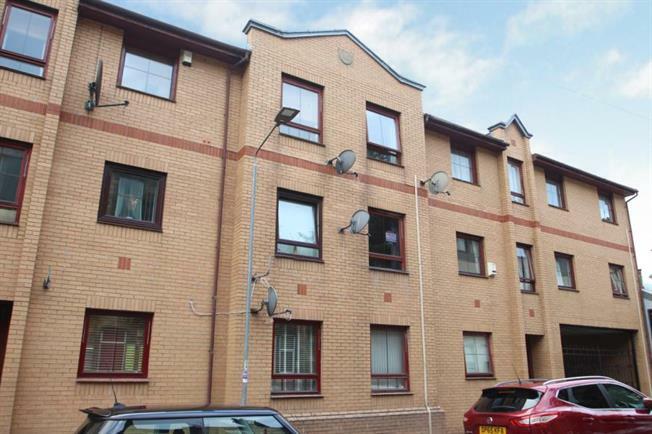 2 Bedroom Upper Floor Flat For Sale in Paisley for Offers Over £80,000. A well presented modern 1st floor flat which is conveniently placed for Paisley Town Centre and Paisley Canal rail link. The spacious accommodation comprises of a welcoming reception hallway leading into a large lounge/dining room benefitting from attractive open aspects across the adjacent parkland. The kitchen is accessed from the lounge and offers ample storage as well as also enjoying the picturesque outlook to the rear. Furthermore there are two double bedrooms both of which benefit from fitted wardrobes and the accommodation is completed by the bathroom. The specification of the property extends to gas central heating, double glazing, security door entry, private off street gated parking and a tandem sized garage. Viewing highly recommended in order to fully appreciate the location and the accommodation on offer.